Filling: Pour chocolate chips into a small bowl and set aside. Heat heavy cream in a small saucepan over medium-high heat. Bring just to a boil. Remove from heat and pour hot cream over chocolate chips; stir with a wire whisk until smooth. Stir in butter, 1 tablespoon at a time, until combined. Stir in brandy flavoring and nuts. Spoon mixture into baked tart shells. Refrigerate until firm. 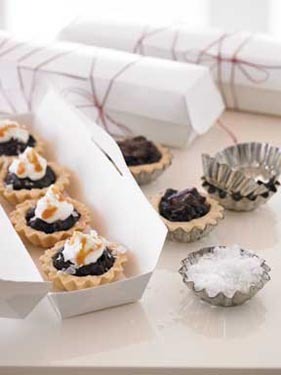 Before serving, top with whipped cream and drizzle caramel topping over each tart; sprinkle top of each tart with a few grains of coarse or flaked salt. Makes 6 six-inch tarts (12 servings). Tip: One 10-inch tart pan, with removable bottom, may be used in place of six-inch tart pans.